I had a brainstorm last night. 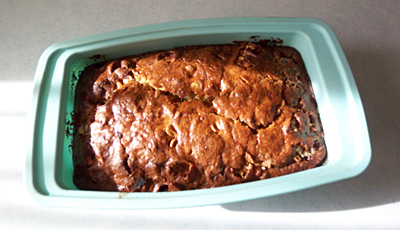 We were getting ready to make banana bread with four bananas that were over ripe. Usually we add chocolate chips, but this time I thought... let's add peanut butter chips and mini marshmallows! Combined with the banana it will be like a fluffer nutter baked into bread! I present to you Jenny's Fluffer Nutter Bread. I also got to use the Martha Stewart silicone bread pan I got for Christmas. The loaf popped right out. Very nice. Preheat oven to 350 degrees. Smash together bananas and butter in a large bowl with a spoon. Mix egg,vanilla and sugar into bananas. Mix in baking soda and salt. Mix in flour. Mix in peanut butter chips and marshmallows. Butter and flour a 4x8 in loaf pan. Pour mixture into loaf pan and bake for one hour. YUM Jenny. I must try that someday. I just got back from the grocery store and there was a sign apologizing because there are no bananas. Weird, huh? 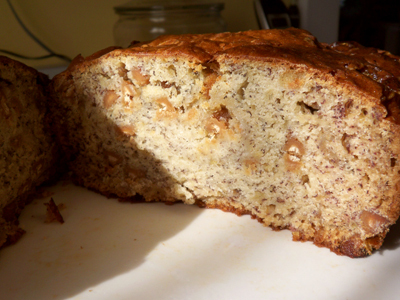 What banana bread recipe do you use, if you don't mind? 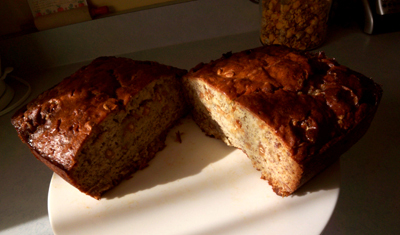 I keep telling myself to stop wasting bananas around here but I've never made b-bread before. it looks great...how did it taste? We must have a recipe. It looks yummy! I've been reading for awhile, and I know how you love Method products... A Method store just opened up on Newbury St in Boston! And it is great, of course. Fluffer nutter bread!!??? Well there goes my diet. well now that is downright brilliant! Great idea! So, how was it? As good in practice as in theory? Jenny, will you plesae post the recipe? That looks great! We love fluffernutters at our house! I'd love the recipe. but how did it taste??? Genius! I can't wait to try! The bread tasted great. I just added the recipe to the blog post. Lord help me, I'm so making this. I made this... and added a cup of dark chocolate chips... oh so yummy. I found this through stumble upon, btw... great site!